So, last night Kate Elliot posed a simple question on Twitter: Which of the various Star Trek franchises was your favorite? Lots of responses, as you might imagine. I read through the comments and there was some convergence on DS9 plus many comments about the excellence of Patrick Stewart, both of which I agree with. Star Trek: The Original. As far as I’m concerned, the viewers brought more to the original ST than was ever actually in the series. Campy acting – I’m talking about Shatner, of course – plus often silly plots and sometimes questionable themes. And I get that miniskirts were seen at the time as a feminist symbol, but today they look so like quite the opposite, not that it’s fair to hold that against the show, and yet. I mean, I love Nichelle Nichols, but she did not get to do much in that series. And today, if you go back and look at the special effects, well. I’m pretty sure I didn’t see a single commenter declare that the original series was their favorite. I am sorry now that I didn’t think of calling out for Redshirts, though, because that may not be a TV show or movie, but it is a fun send-up of the original Star Trek. I still like Galaxy Quest better, though. 1. My Enemy, My Ally by Diane Duane. Duane wrote other tie-ins, including sequels of this book. This is my favorite. Ael t’ Rlailiiu is a wonderful protagonist and the original crew are captured perfectly and shown to advantage. 2. The Final Reflection by John M Ford. As the former book emphasizes the Romulans, so this one emphasizes the Klingons. 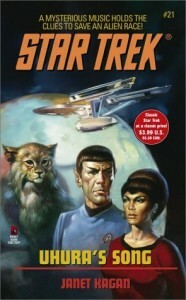 I’m not a Klingon fan particularly, and this book features a Klingon protagonist. Human characters are distinctly secondary and the original crew does not appear except in a very brief frame story. Yet, it’s an excellent and compelling story. The Klingons as presented here interfered with my ever accepting the Klingons as they were presented in ST: TNG later. 3. How Much for Just the Planet? by John M Ford. Though Ford wrote both this and the previous book, they could not be more different. The former book is a serious work and a “real” ST tie-in. This one is a Gilbert and Sullivan operetta disguised as a ST tie-in. It is absolutely hysterical . . . no, really, it is a comedy masterpiece . . . but you wouldn’t try to fit it into the canon. 4. 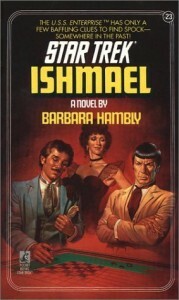 Ishmael by Barbara Hambly. Recalling the earlier post about comfort reads, this is one for me. I have no idea how many times I’ve read this story, in which Spock gets stranded on Earth in 1867 in the backwoods logging town of Seattle, with no memory of who he is or what he’s doing there. Hambly did a wonderful job with this, and in retrospect I can see how in some ways it’s right up her alley. You can sure see her wonderful ability to evoke historical settings. 5. Uhura’s Song by Janet Kagan. This is a leisurely story of alien contact, though the frame story lends urgency. The alien species is well drawn, the original crew is also drawn very well, and the new character – Evan Wilson – is brilliant. I so wish Kagan had written more in general and perhaps I wish particularly that she’d written further ST tie-ins, preferably with Evan appearing in them, too. Every one of those novels is so much better than the Original TV show ever was. Star Trek: The Next Generation. I didn’t notice many people picking this as their favorite ST franchise, though so many people called out Patrick Stewart as a great actor. I agree on both counts. I watched a lot of ST: TNG – I watched a lot more TV back then – but I can’t say I remember it very fondly. What I disliked about it, in order from mild dislike to fairly intense dislike: Yar, Worf, Beverly Crusher, Riker, Wesley Crusher, and Troi. In other words, I disliked practically the whole crew except Jean-Luc Picard. I thought Yar and Dr. Crusher were boring, Worf was too often played for comedic effect, Riker was decorative but struck way too many heroic poses, Wesley was just annoying, and the best writing in the world could not have saved Deanna Troi for me, the whole concept of her character was so annoying. I did like Data, though. And Geordi was okay. I did try to read one ST: TNG tie-in that was strongly recommended, but I didn’t make it fifty pages. Don’t remember which one it was, sorry. Star Trek: DS9. Okay, actually, I didn’t watch every season of DS9, but if I were going to get any of the shows on DVD, it’d be this one. I could see myself re-watching it. In stark contrast to TNG, I liked practically every character on DS9, especially Odo and Garek. The show seemed to be more consistently well-written, with better, more complex plotting and better, more complex characterization. A lot of commenters mentioned that the female characters were better drawn on DS9 than on TNG. I absolutely agree, but then I think this was true for most of the male characters, too. Remember the episode where Garek told one story about his past after another, all of them mutually contradictory? Wasn’t that great? Remember “Our Man Bashir”? Those are a couple of the episodes that have stuck in my head. I’ve read one DS9 tie-in novel, Fallen Heroes by Dafydd ab Hugh, which was recommended to me. I liked it quite a bit and still have it on my shelves. It’s got a time travel element that complicates the situation and highlights Quark and Odo. Normally I dislike Quark, but ab Hugh made me like him in this story. Star Trek: Voyager. Best forgotten. It had so much potential. I loved the initial set up. Unfortunately, I hated almost everything about the way the series developed and I don’t think I watched it at all after the first season. Star Trek: Enterprise. Seriously, this was the best they could do? I watched the first few episodes with a lot of hope that gradually dwindled – actually, I guess it rapidly dwindled – and then I stopped watching it. How long did that show even last? Oh, I see that according to Wikipedia, it ran for five seasons. I didn’t get the impression it ever got better, but Wikipedia suggests the final season wasn’t bad. While we’re on the subject, I did like most of the movies, especially “Wrath of Khan.” It was cheating to bring Spock back, but personally I was glad they did because who wants to lose Spock? I don’t know how well all those movies would hold up if I watched them again now, though. I must admit I never saw the ST: TNG movies. Wikipedia says there were four of them. I didn’t even know that. The first ST reboot movie was a lot of fun, I thought. Great young McCoy, good young Kirk, good young Scotty, decent young Spock, and though I know some fans objected, I personally got a kick out of Uhura and Spock being an item. I didn’t see the second reboot movie, but that’s just because I don’t see a lot of movies, not because I was avoiding it. How was it? Should I seek it out? I see there is a third planned for next year. So, now: how do you rate the different Star Trek franchises? And, if I missed your favorite ST tie-in, especially anything published within the last ten years or so, especially Original Series tie-ins, let me know, right? Because I definitely love the universe when it’s done well, and I haven’t looked at tie-in novels for years. Decades. It’s hard to browse when you have no bookstores within eighty miles, and tie-ins cry out for browsing rather than just trying to pick them out online. Previous PostMost Hyped Book I’ve Never Read	Next PostPluto! I really like Diane Duane! I think I knew she’d written some ST novels, but I’ve never run across them. Maybe in that used book store pilgrimage I’m going to make soon . . .
TNG was my franchise; I watched it faithfully with my dad every week when it came out. I agree with the dislikable characters, but Data and Picard carry the whole show, in my opinion. Yes to Galaxy Quest, though! Brilliant movie! Diane Duane actually wrote quite a few ST tie-ins, as you’ve probably discovered by now. The Romulan Way is also a great favorite of mine and I could have easily put it on my top five list. I rather like all of her ST work. I guess my ST is original series, since I did TRY to watch the others, and always found myself reading instead – none of them could hold my interest. I’ve actually seen Shatner in a couple pre-trek movies, he was fine in them. 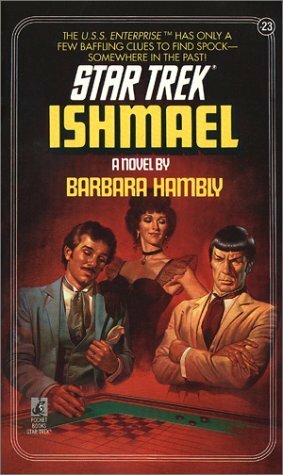 And of the few tie ins I’ve read Hambly’s ISHMAEL is the only one that stays in memory. Galaxy Quest was a hoot. I think I watched ST: Original series at the right age, which is to say, as a kid. I didn’t see its flaws until later. It’s true I’ve thought Shatner did an okay job in other work, but the pointed over-the-top emoting of the captain in Redshirts, well, you didn’t have to wonder where Scalzi got the idea for that.